The big news with the climbing-oriented Mission 50 pack is that it employs Black Diamond's patent-pending 'reACTIV' suspension system. ReACTIV suspensions, and the more aggressive 'ErgoACTIV', are designed to allow the pack to move naturally while you're walking by adding a mechanical pivot to the frame-hip belt interface. In other words, the load is allowed to swivel, to some degree, in the hope that this will result in a more efficient carry. Black diamond has whole-heartedly embraced the concept, to say the least. 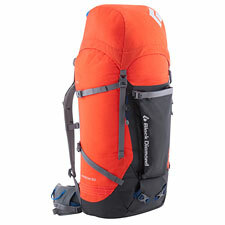 You'll find the various ACTIV suspensions employed throughout Black Diamond's 2012 backpacks. It's hard to talk about the Mission pack without talking about the suspension, because it is the suspension, and the consequent way that the pack carries weight, which is likely to make the biggest impression on you. This is true almost almost regardless of the Mission's other features, many of which are on their own quite sharp and otherwise noteworthy. Is the pack's ReACTIV suspension noticeable in actual use? Yes, absolutely. Wearing the Mission pack, I discovered right away that the load moves from side to side somewhat more than with a traditional suspension. That said, I suspect whether or not this motion results in a more efficient and natural stride overall will be a question whose answer will vary tremendously from user to user. More simply put, some people are going to love it, and others are going to hate it. For the less-motion-is-more crowd, the Mission's implementation of the ACTIV suspension is less aggressive than the Ergo version, found in packs like the new Epic. So if you'd prefer to stay closer to the feel of a traditional pack, the Mission is the better choice. Objectively, I just don't think there's ever going to be a definitive answer as to whether or not the physics of the pack are more or less favorable than a non-pivoting frame. As I say, the end result is likely to be highly dependent on the individual user. That said, I am concerned about the Mission's potential vulnerability to oscillations—particularly when carrying skis. Suspension questions aside, I think the Mission is the best Black Diamond climbing pack since the excellent old Quantum. Like the Quantum, the Mission is feature-rich without feeling excessively gadgety. I particularly liked the Mission's hip belt, which is shaped especially well for narrow hips, and I liked the pack's tool attachments, which are a nice blend of traditional and modern. The Mission includes A-frame ski loops which seem to route the ski's weight directly to the frame—a big plus for those of us who take our planks with us. As for load-worthiness overall, I thought the Mission clearly carried heavy and awkward loads better than Black Diamond's current Speed-series packs...but not so well, I'm sorry to say, as the discontinued Quantum.